Cabitan in the Philippines is a rural paradise. But it also is home to many families and children living in extreme poverty. 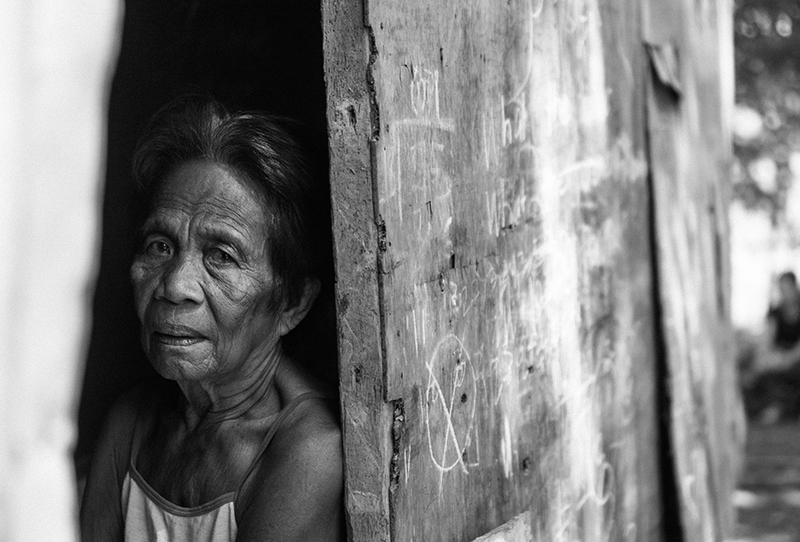 On a recent trip to the Philippines, Compassion's Media Specialist, Michael Cauchi, learned firsthand about the complexities of hidden poverty. The track is long and winding. We hack through the overgrown grass as we make our way through the middle of the field. Suddenly, we are hit with a smell that takes our breath away—animal manure, and it fills the thick air. We come into a clearing and see the house. A patch of overgrown bushes and trees shadow the rusted house sitting on stilts. The corrugated iron roofing is littered with holes, scattering drops of sunlight in the house called home for a family of 12. Beside the house lies a vacant mud pit that previously housed the family’s livestock. Flies and bugs cover the outdoor kitchen, attached to the rear of the home. They also cover the ground beneath our feet. This is the home of John Gerald Alarcon. This is his everyday reality. Four-year-old John is one of nine children. He lives with his Aunt Rosie, his seven sisters, elder brother and two cousins, Rosie’s children. Rosie cares for all of them. John’s father died suddenly a few years ago from a heart attack. Needing some way to care for her children following his death, John’s mother moved to Manila to find work. This leaves Rosie to care for 11 children. As we meet John and his family I’m struck by the thought—poverty is often hidden. Rural poverty, like what we experience in Cabitan, the Philippines is sometimes not visible to those outside. But you barely need to scratch the surface to see the devastation poverty has in provinces like Cabitan. Cabitan is found on the island of Masbate, the Philippines. Masbate, despite its rich economic resources and beauty, remains one of the poorest provinces in the country. We are surrounded by a valley that boasts such beauty, it’s hard to fathom the challenging life facing John and his family. 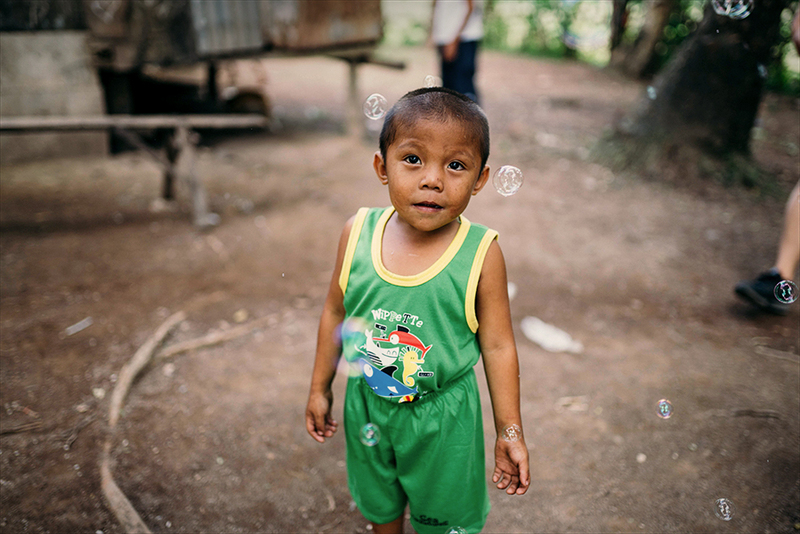 On this island, Compassion has started working with local churches to establish the Child Sponsorship Program. And on this trip, we were there as John was told he was sponsored. Ken Outch, manager to Compassion Ambassador Dami Im, was with us on this special trip. Along with Dami and her husband Noah, Ken was there to learn more about the work of Compassion and understand the work on the field. When Ken met John and saw the need, he knew that he had to do something. He decided to sponsor John. Ken then spent the afternoon with John, Rosie and the family, laughing, sharing stories, playing with bubbles, balls and giving gifts. It was an incredible time of shared joy, as John’s new sponsor became part of the family for just a moment. The local church Compassion partners with in Cabitan knows John and his family, they understand his needs and that of his community. 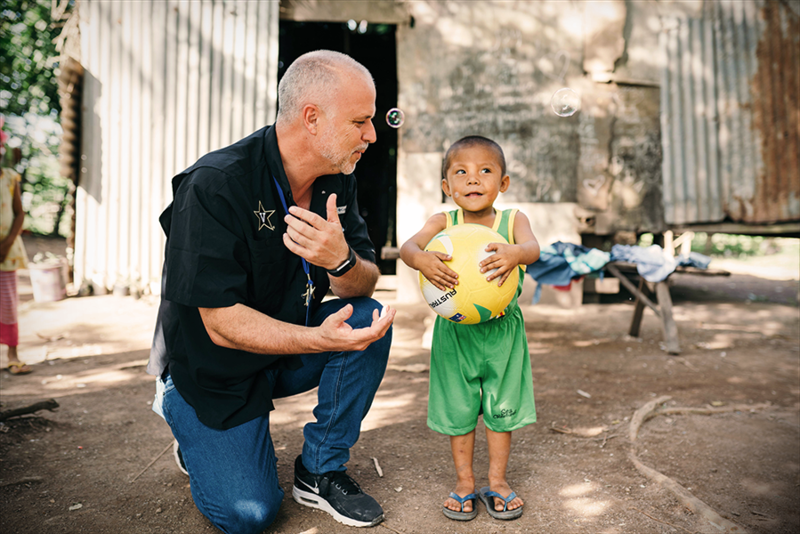 Along with Ken’s support, the local church will continue to help John’s family and ensure he receives the medical care, food security and emotional support needed to help give him the best chance at life. It was hard to visit John’s family that day and see their current situation; it was difficult to come face-to-face with the hidden nature of poverty. But one thing each of us found in the family home that day was hope: hope for a different future, the hope and resilience Rosie has for the children she so lovingly cares for, and the hope the local church has for this community. Sponsor a child and give a hope more powerful than poverty.